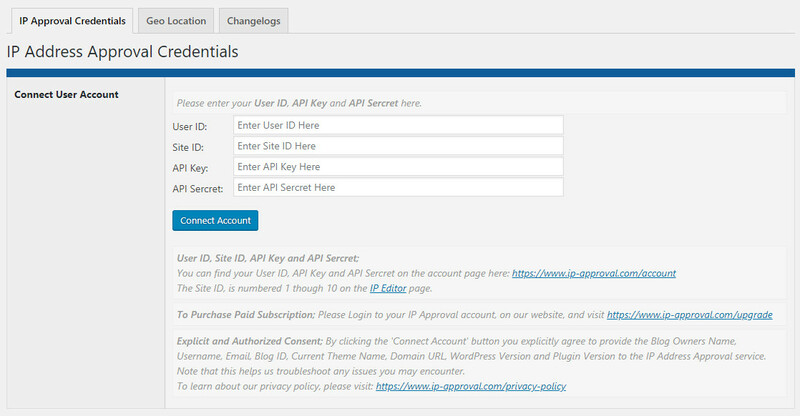 Add your User ID, Site ID, API Key and API Sercret, then click the Connect Account Button. The Site ID, is numbered 1 though 10 on the IP Editor page. You can enable or disable the IP Approval Service on the entire website. Check the box to limit access to the WordPress Admin Login Page. Use this feature to open or close your website. Note: If your website is 'Closed' it will Remain Open for IPs listed in the 'Remain Open for IPs' list. 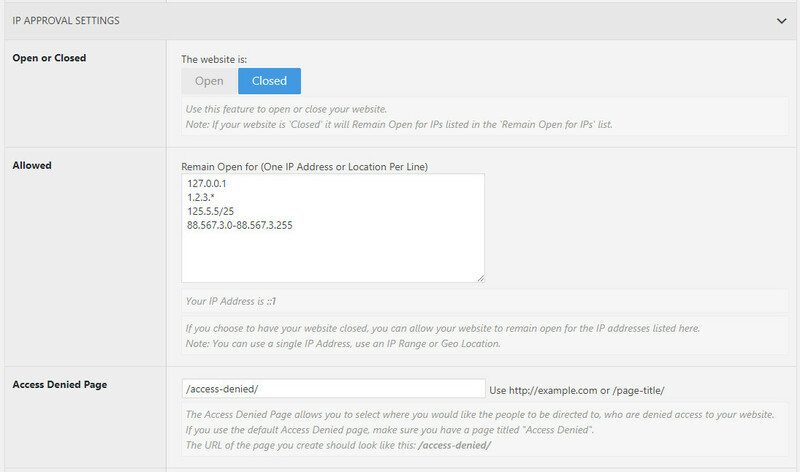 If you choose to have your website closed, you can allow your website to remain open for the IP addresses listed here. The Access Denied Page allows you to select where you would like the people to be directed to, who are denied access to your website. If you use the default Access Denied page, make sure you have a page titled "Access Denied". Whether your website is opened or closed, you can block specific IP addresses by adding them to the Banned IPs box. 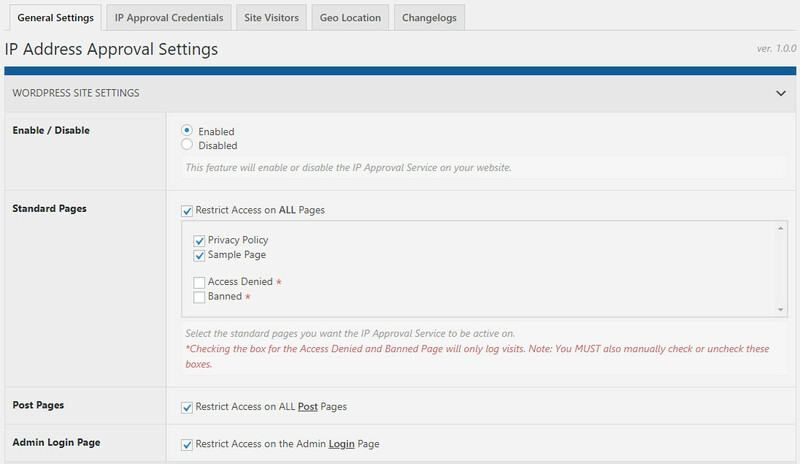 The Banned IPs Page allows you to redirect visitors who have been banned from your website. If you use the default Banned page, make sure you have a page titled "Banned". Note: Remember to click the 'Save Changes" button anfer making any changes. Please also noted that the "Reset WordPress Settings" will only reset the WordPress Settings. The Log displays the IP Address, linked to the GEO Location Map, the User Agent, Page Visited and the Date & Time of the visit. You can set your TimeZone on the Account page of our website. This also shows if the IP Address is Allowed(Green Plus) or Banned(Red X) or Neutral(Grey Minus). Clicking the circle allows you to to easily add (or remove) the IP Address to the Banned and Allowed list. You can select IP Addresses from the list by selecting them, or by using the 'Select All' option. Visits are stored for 30 days. The Per Page option allows you to select how many visits are siplayed in the log, the default is 20. If you would like to export the list, please log into your account with us and visit the IP Editor page > Site Visitors Log.